I wanted to thank you for your recommendation of the Critter nation small animal habitat. For anyone who doesn’t know my story, I started out with 2 female rats in the Petco Rat manor. After losing one rat and adopting 3 more we grew out of that cage. The Critter nation is a fantastic cage for various reasons. My girls love the space and on days when they don't get as much free roam time I feel less guilty. All of my rats can get in and out of the cage by themselves during free roam time. They go back for water or a quick snack. Many cage are not low enough to the ground to offer this. 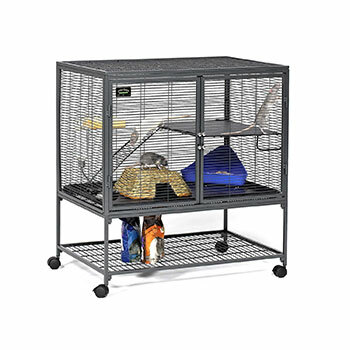 Cleaning the cage is as easy as it can get with the wide open door and the pull out trays, it cuts my cleaning time by half. My girls are not “potty trained” so the lack of depth in the bottom pan was initially a concern. I put a larger than normal “litter box” in the bottom and put fleece over the trays and it has worked wonderfully. Most of the time they go to the bathroom in the litter box but the urine that is dribbled is easily managed by the fleece coverings. There are cages cheaper but this cage is by far the most worthwhile investment. Even with 2 rats if I could do it all over again I would start with the critter nation.